Every year for the past six years, I have tried to go to the Society of Wine Educators conference. I go for a number of reasons: to see old friends, meet new contacts, take great seminars, travel to the regions around where the conference is held and learn more about Californian wines. Many of the seminars at the conference tend to focus on wines from California and the conference is often held in California so I have been able to participate in my fair share of these tastings. Why California one might asks? It seems obvious to me although maybe it isn’t because I am largely associated with Old World wines and specifically with Italian ones but to be a well-rounded wine professional in America, California is a primary area of study and should be of knowledge. So instead of taking a class on Barolo Vs Brunello, this year, I opted for one on the Livermore Valley. Apparently C. H Wente, James Concannon and Charles Wetmore founded the first wineries in the Valley in the 1880s. 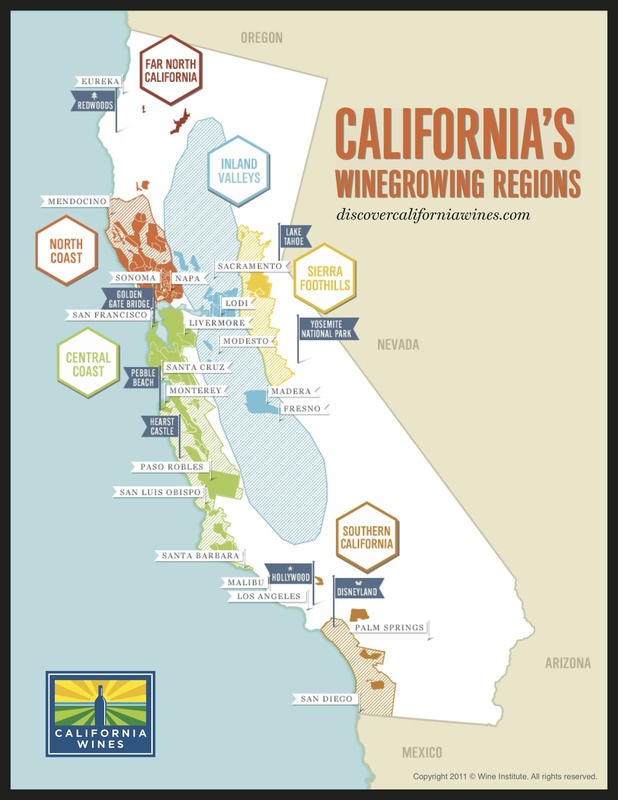 According to the association’s website, the “Livermore Valley put California on the World Wine Map by capturing America’s First Gold Medal for Wine in the 1889 Paris Exposition.” Today there are 50 wineries in the area and it lies just an hour east of San Francisco as you can see from the map. An odd fact is also mentioned on their website, “Nearly 80% of California’s Chardonnay vines trace their genetic roots to a Livermore Valley clone.” Who would have thought that? Certainly not me. According to Steven Kent of the eponymous winery, some of the secrets to the success of the Livermore Valley in creating great wines include the fact that it runs from East to West, its great diurnal temperature swings, its microclimates, rock soils, elevation 500-1000 ft above sea level and its long growing season. The area also permits grapes to have good acidity as well as phenolic ripeness, not always an easy task. Kent said the soils maintain enough heat here but do not have “wet feet” from irrigation. We tried a number of his wines from the Steven Kent line as well as the Lineage line and the La Rochelle wines. He also showed us wines from Fenestra, Nottingham Cellars and McGrail vineyards. All of the wines showed considerably acidity despite their jammy flavors and high alcohol content. I also found them to be quite earthy and herbaceous on the whole with silky tannins and judicial oak treatment. I was partial to the single Bordeaux varietals that were shown both a Petit Verdot and a Cabernet Franc. The Kent winery often makes 100% mono-varietal wines from the Bordeaux varieties that are cultivated. On the whole, the wines were all well made and interesting if a bit bold for my palate. I can see why the Mirassou family picked this area for their wineries. I look forward to visiting on my next trip to San Francisco.